HAMPTON, NH - Seacoast United was well represented by 5 teams at the US Club National Finals, taking place at Grand Park, Indiana during July 21st-24th, 2017. The 2004 girls NPL competing in the highest division (Super Group) returned with 3-0 win against NJ Stallions Academy Sting, 2-0 win against Pinecrest Premier 04 Girls Blue and one loss against eventual winners FC Dallas. Coached by Kim Foley in the absence of head coach Chris Scott who was attending a USSF coaching License course performed exceptionally well in extreme heat. 2003 Girls Premier Blue IS team also returned from the competition performing in the Super Group with a 3-0 win against Libertyville FC and an excellent 2-0 win against NPL league winners Spirit of Liverpool (MA). Unfortunately, the team’s earlier 3-1 defeat against Hawaii Rush 03G saw the girls eliminated from the semi-final on goal difference. Hawaii Rush fell short in the final by one goal in double overtime in a very close game. “We were disappointed not to make the National Semi-final due to goal difference,” commented Iain Scott, Seacoast United’s Director of Soccer Operations. “The defeat against Hawaii was more down to fatigue with many players arriving tired from college and ID training camps. We all know if we had made the next stage the result against them next time would have been different,” added Scott. 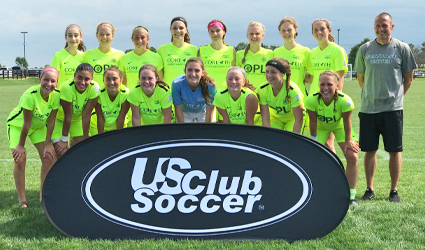 02 Girls NPL team coached by David Burgess cruised through to the semi-final stage with three straight wins in the Super Group, 2-0 win against eventual winners Massapequa (NY), 4-0 win against Lou Fusz O’Rourke 02 (MO) and finally 2-0 win against GPS 02 Girls Charleston (SC). In the 2002 Semi-final, a hard fought 3-1 win against NJ Wildcats Averbuch NPL saw the girls advance to the Super Group National final, a rematch vs Massapequa. Seacoast United a very close game on a long range shot late in the second half. SUSC pushed for the equalizer, but Massapequa was able to hang on to win the title. 2001 Girls NPL coached by Matt Willey also progressed to the national semi-finals by means of goal difference following two draws and a win in their bracket. The team started the campaign with a 2-2 draw against Pittsburgh Riverhounds (PA) and followed that up with a 6-4 victory against Indiana Fire with striker Paige Laberge scoring four of the six goals. The teams last game saw them tie 0-0 in a hard-fought encounter. The 2001G semi-final game against South Shore Select (MA) ended in a 3-0 defeat, however the game was much closer than it appears with South Shore scoring two late goals as Seacoast United gambled to get the equalizer. 2004 Premier Boys coached by Rob Thompson performed very well despite losing all three games against the best three teams as a result of the tournament draw. Two of the teams in their bracket both progressed to the final, eventual winners Apple Valley SC Storm Academy deservedly won overall but were given a tough game against Seacoast United 04 team in the group stage. “Overall I’m delighted by the performance of our players. 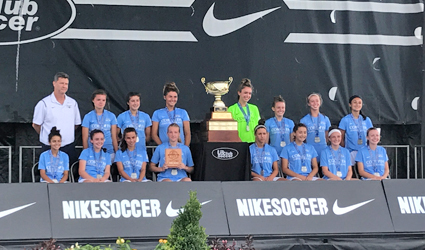 This was a great experience for all and highlighted the quality of Seacoast United teams on the National stage,” added Scott.